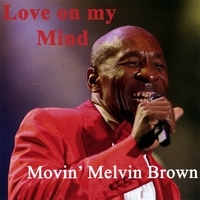 Movin’ Melvin Brown is not Al Green, and neither is he Otis Redding. However, at times you might not be able to tell the difference. It’s not that Brown is consciously imitating those soul legends; he’s just coming from the same state of mind. Who knows how musicians such as Brown are able to sing so beautifully, to project their feelings in such a powerful way that we are left swooning. “My Summer Love” is a poem set to music, a slow, relaxing groove which allows Brown the freedom to make his voice soar, reaching the heavens above. Wow. This is one of those CDs that, upon hearing it, you want to see the artist perform live. Can Brown sing like this in concert? Most likey as there doesn’t seem to be any studio trickery here. For more authenticity, Brown is actually from the tail end of the soul-music years that he is paying homage to here. During the ’70s, Lionel Richie and the Commodores used to open for Brown’s show band. Imagine that! At 14 tracks, and nothing dipping below the four-minute mark, this album is a genuine bargain, and Brown is one of a kind, definitely.